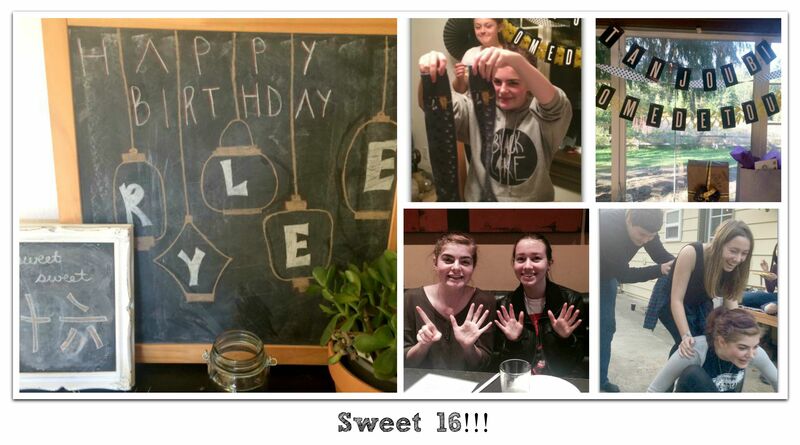 We celebrated our oldest granddaughter, Rylee Joy’s “sweet 16th” birthday this weekend. It’s hard to believe that it was 16 years ago today that I first held that precious little bundle in my arms. The feelings I had on that day are forever etched in my heart and mind. That sweet little bundle has grown into a beautiful young lady, on the inside and out. I couldn’t be prouder! Because Ry is our oldest granddaughter we have experienced many “firsts” with her. The first to go to school, the first teenager and among many, many other things the first to drive a car! Driving is a big first, it opens up a whole new world of freedom. I compare it to when a baby first becomes mobile; crawling and then walking and so many new things become reachable! I do think I’m much more relaxed and patient than I was when my children were learning to drive. So the experience has been fun and Ry wants to drive every time we’re in the car together now. She’s becoming a very good driver and I love being chauffeured by her. This weekend has been a fun celebration with family and a few of Rylee’s closest friends. Two of which she has known since we moved to the Peninsula 10 years ago. We celebrated her 6th birthday in our backyard with a “daisy” party with these same two friends! Two of Rylee’s favorite things are cats, and the Japanese culture. So of course she wanted these two things to be the theme of her sweet 16 party. Ry’s mom Kim, is very creative so she had no trouble with combining both of her favorites. 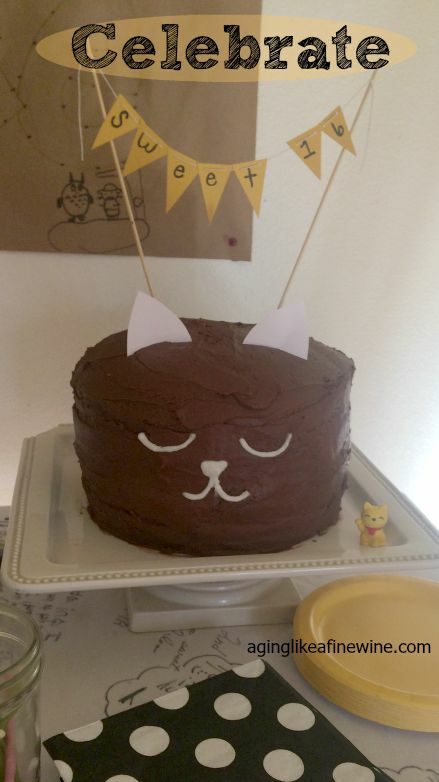 The decorations were black and yellow and the party was complete with a “cat” cake, Japanese lanterns, Japanese themed candy and foods and a birthday banner in Japanese. Every year Kim uses the same white tablecloth and family and friends use permanent markers to write birthday notes to Rylee. It is a very cherished tablecloth! This has been a great weekend of laughing, games, presents, and good food. The party ended with a trip to Seattle for what else….sushi! For Mike and I, life would not be complete without children and grandchildren. I recall so clearly feeling so much love for our first baby that I was concerned I wouldn’t have enough for the second one. The minute I knew I was pregnant with our second daughter I discovered the answer! Your love for each one is not divided to make room for the next, it simply multiplies! So it is with grandchildren, your love continues to multiply. 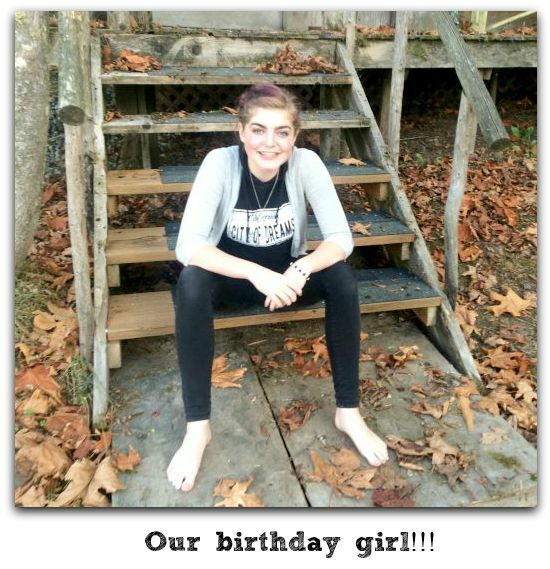 Happy Birthday to Rylee!!! I just love your Blog, it reconnects me to you all! Thanks Renee! All of our babies are growing fast….I do love having teenagers!